It’s little wonder El Dorado Hills is well-populated with transplants from other regions of the state: The hilly terrain, the oak trees, the endless views are all reminiscent of parts of the Bay Area and Orange County&emdash;but without the hopelessly snarled traffic and outrageous home prices. One such transplant is local real estate agent Peggie Ryan-Lanigan, who moved to El Dorado Hills in 1979 with her husband and 9-year-old daughter. Our first house was in Marina Village, and across the street was nothing but rolling hills and a few cows here and there, she recalls. It was a very sleepy town&emdash;no market, no theaters, really pretty vanilla. But we loved it. It’s so beautiful here. In addition to the area’s natural beauty, this young family was drawn to El Dorado Hills by the same things that continue to draw families today: good schools, a nonexistent crime rate, nearby major employers and a strong sense of community. I knew how things were in the Midwest&emdash;people bring you cookies when you move into a neighborhood, says Debbie Manning, president and CEO of the El Dorado Hills Chamber of Commerce, who moved here with her family 14 years ago from St. Louis. That happens here, too&emdash;even now. El Dorado Hills cannot rightfully be called sleepy anymore: There are all kinds of stores now, and a popular new theater complex lures moviegoers from neighboring towns. The population has boomed from 14,000 in the early ’90s to more than 40,000 today. And many of those new residents have opened businesses: Six years ago, we had 200 members in our chamber, says Manning, and there are 600 now. Even those who loved the early days of El Dorado Hills are pleased with the progress. Over the course of the years, it’s grown&emdash;but in a very positive way, says Ryan-Lanigan. El Dorado County is extremely conservative about development. Even though I’m a real estate agent, I’m first and foremost a resident. And I don’t want El Dorado Hills leaping into [becoming] a metropolis. It’s [still] a nice place to be, a nice place to raise a family. That doesn’t mean development isn’t taking place, of course&emdash;just that it is thoughtful and well-planned. Business and retail are balanced with a variety of housing options, and there is an ever-growing list of after-hours activities for the whole family. 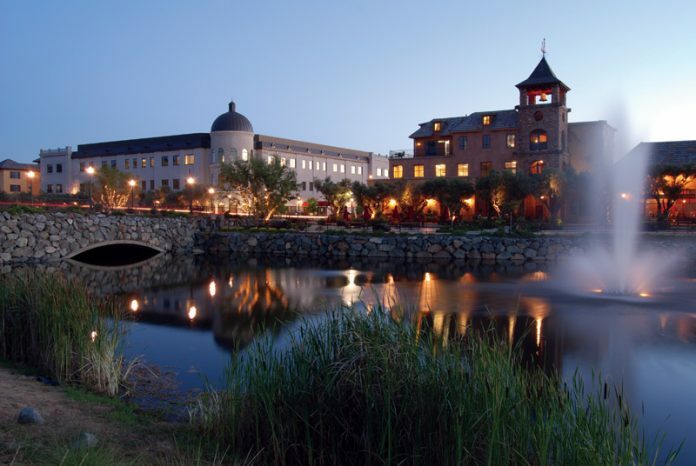 El Dorado Hills may not be a metropolis yet, but it is near one, located 30 miles east of Sacramento in the Sierra foothills. It is relatively close to the major employers and glitzy shopping malls of Roseville in Placer County and neighbored by the growing city of Folsom. In fact, Folsom is where many El Dorado Hills residents once flocked for goods and services&emdash;even basics, such as groceries or a dinner out. And while residents still commute down the hill to the big-box stores, which developers here have shied away from in response to voter surveys, El Dorado Hills now offers destination shopping of its own. There used to be a lot of â€˜retail leakage’ to Folsom, admits Manning. But now we find Folsom is coming here to shop, too, as we develop our â€˜boutique’ retail, and we’re seeing a balancing out of the tax dollars. The best place to find this kind of retail is in El Dorado Hills Town Center. Begun in the late 1990s with two service stations, a post office and a McDonald’s, it has since become a pedestrian-friendly shopping center in the middle of El Dorado Hills, featuring broad sidewalks, fountains and an outdoor amphitheater for live performances. People are coming from all over the region, says Manning. It’s a place you can easily while away an afternoon. Catch the latest summer blockbuster at the Regal Cinemas 14, the new 14-screen multiplex with stadium seating. Grab a bite to eat at Maui Tacos, A Maad Tea Party Caf, Mama Ann’s Italian Deli or the newly opened Chili’s. (Soon to come: Mikuni Japanese Restaurant & Sushi Bar, Original Pete’s Pizza Pasta Grill and Wine Konnection.) As for those boutiques, drop into Posh Punkins (children’s clothes), Philosophia (cards and gifts) and Olive Tree Furniture, along with jewelry, women’s apparel and shoe stores, or indulge yourself at a full-service spa. You can even buy yourself a car: Von Housen Automotive Group’s Mercedes-Benz of El Dorado Hills is located here. And what’s on the way? Target and Nugget Markets. Town Center is the vision of local developer Tony Mansour, who came here in 1979 and, with a group of investors, bought 8,000 acres, most of which would eventually become the master-planned golf-course community of Serrano. Mansour’s next goal was to create a town center&emdash;a Main Street, a European village&emdash;offering shopping, cafes and a place for community events. We just held the El Dorado Hills Art & Wine Affaire at Town Center in May, says Manning. It was estimated 5,000 people attended on Saturday and 7,000 on Sunday. El Dorado Hills also held its inaugural Christmas tree lighting at Town Center last year&emdash;a tradition it will continue and which is expected to draw more than 2,500 onlookers. In addition to Town Center, new retail is under development at White Rock and Latrobe roads and at several existing shopping centers, including one anchored by the newly built Safeway at Green Valley Road and Francisco Drive. There also is office and light-industrial space at the El Dorado Hills Business Park. Major employers for the area include Blue Shield of California and DST Output&emdash;both with locations in El Dorado Hills&emdash;as well as Intel and Verizon Wireless in Folsom and Hewlett-Packard in Roseville. Marshall Hospital, up the road in Placerville, employs 1,200 people in El Dorado County, including 160 physicians, many of whom keep offices in El Dorado Hills. located, too, with many elementary schools nestled in neighborhoods, making them within walking distance. There also is a strong sense of community spirit, say residents. People who come here describe our community as very tight, says Ryan-Lanigan. There are block parties, school fundraisers, crab feeds&emdash;you can be as involved as you want to be. And I’ve been here so long, you know, every time I run into the grocery store, I’m stopped by people who want to talk. Everyone wants to talk about real estate. That’s no surprise, with banner headlines declaring the bubble has burst, the market has tanked. But has it? Ryan-Lanigan tells people&emdash;right there in the aisles of Safeway&emdash;that most of those stories are written about national trends and include areas where housing starts stalled due to blizzards or tornadoes; they don’t necessarily paint an accurate local portrait. Because, you know what? Things in El Dorado Hills are selling&emdash;especially the high-end market, says Ryan-Lanigan, who suggests there is a silver lining to the overall drop in home prices. It’s definitely a time to move up, she says. You may not get what you would have five years ago for your house, but you’ll save on the buying end. If you’ve had your eye on El Dorado Hills, there might not be a better time to buy a home here. And you have lots of choices. The biggest housing development is the award-winning master-planned community of Serrano, built around a par-72 golf course designed by Robert Trent Jones Jr. It includes a 34,000-square-foot country club with tennis, swimming and exercise facilities, as well as a golf shop and two restaurants. The gated community has 17 miles of trails, 1,000 acres of open space and some of the prettiest views in town. Serrano really has a variety of homes and lifestyles, says Ryan-Lanigan, who’s lived in Serrano for the past three years. There are homes from the lower $400,000s to $3 million. Another community is The Promontory, which overlooks Folsom Lake and has views of downtown Sacramento, the coastal range and the Sierra. There are custom homesites available, along with several developments: Bella Lago by Vista Homes, Villa Lago by Toll Brothers, Bel Tierra by Westwood Homes, Montecito by Christopherson Homes and Toscana by Richmond American Homes. Established neighborhoods also are attractive to homebuyers. All of El Dorado Hills is built in villages, says Ryan-Lanigan. So you can look at Park Village, Ridgeview, Marina, for example, where there are a mix of homes. And some have larger parcels&emdash;one-third to half an acre. Sterlingshire, Highland Hills and Highland View all have half-acre-plus lots. What’s nice in El Dorado Hills is you don’t just have one product to show buyers, but a mixture of communities. While many come here for the jobs, the schools and the safe neighborhoods with tree-lined streets, life’s not all about work and practicalities. In fact, the area’s recreational amenities are a big draw. There are 12 parks, 23 acres of athletic fields and 95 acres of open space. The El Dorado Hills Community Services District offers a variety of year-round activities&emdash;from swimming and dance classes to sports teams. The CSD also runs the recently opened Teen Center, which has foosball, air hockey, PlayStation, karaoke, a computer lab, a dance floor, a homework center and a snack bar with healthful treats, not to mention an 800-square-foot deck that overlooks the adjacent skate park. Residents are proud, too, of the new Senior Center on Lassen Lane, which the CSD opened last summer, in conjunction with the county and the fire department. The community holds all kinds of fun events, including a series of summer concerts held on the Village Green in Serrano; the Family Community Festival held every September at the Serrano Visitor Center, sponsored by the Chamber of Commerce; the Niello Concours at Serrano in early October; tree-lighting festivities at El Dorado Hills Town Center the first weekend in December; the Serrano Easter Egg Hunt every spring; and the Art & Wine Affaire in May, again at El Dorado Hills Town Center. El Dorado Hills also is home to the award-winning El Dorado Musical Theatre Company, which produces several shows every year.